The driving mechanism that pushes the thermoplasts or metals through the heater chamber (for making them liquid) is a very critical one. It needs to push the plastic with a strong and reliable grip. A threaded scew, coach bolt, worm-wheel and pinch wheel versions have been made. 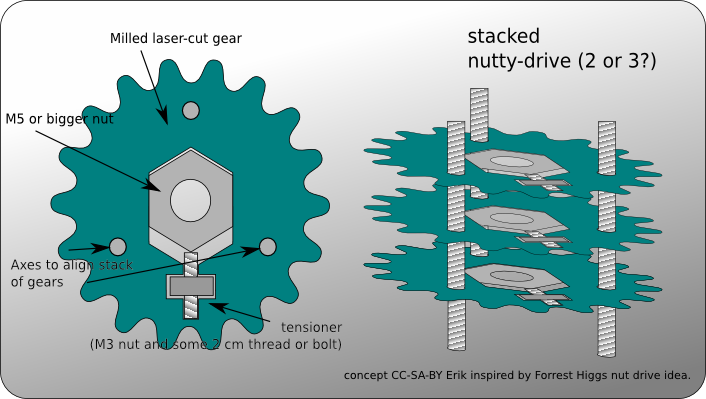 This is another concept, using a nut instead of a thread, inspired by Forrest’s idea (see here). Alternatively, the alignment holes could contain filament to get a tension that is paired with the filament that is pushed through (though about 3 times stronger). Then you don’t even need to have tensioners, just epicentric nuts. Just one of the discs should have teeth (a gear), the other ones could be round. They could be held by 3 skate bearings. p.s. After thinking about Forrest’s idea, you could use a coupling nut to get a nice long threaded section. Re-cutting a sharp thread with a die might also help too. In the BfB-design is also some bolts in the gears, and they are put on the side… This is to prevent sliding of the nut and loosening the tensioner.